The SLG Series servo motor with planetary gear reduction by Exlar offers offers brushless servo motor technology with the highest torque to size ratio available. The SLG Series is now available in frame sizes of 60, 90, and 115 mm. Single or double gear reductions are available at ratios of 4:1, 5:1, 10:1, 16:1, 25:1, 40:1, 50:1, or 100:1. A planetary gear reducer trades top end speed for additional torque. 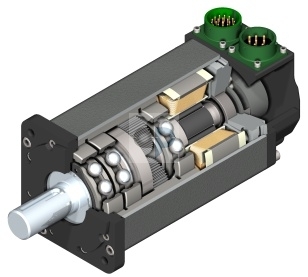 SLG Series motors are available with custom winding designs to meet your speed/torque requirements. Gear reduction reduces the "reflected" inertia, which is the load inertia as seen by the control system, resulting in stable control system operation. Planetary gear reduction provides low backlash, high torque, with loads distributed between several gears simultaneously. The integrated gearhead of the SLG Series simplifies installation and reduces the risk of misalignment that may occur when installing an add-on gearhead. Integrated planetary gear reduction saves space and avoids the need for right angle gear reduction, which consumes power and increases costs. Feedback configurations for the SLG Series are offered for most amplifiers on the market, and custom OEM applications are also available. The SLG Series case is IP65 sealed, and features Viton seals and synthetic lubricant with extreme pressure additives.